Events/Classes | not your average studio. RustiQue | studios will be offering a wide array of open photography and art events, small workshop series and seminars. WE provide professional models, lighting setups, makeup artists, props, etc. YOU bring your camera, come and shoot, experiment, and walk away with new ideas and networking! 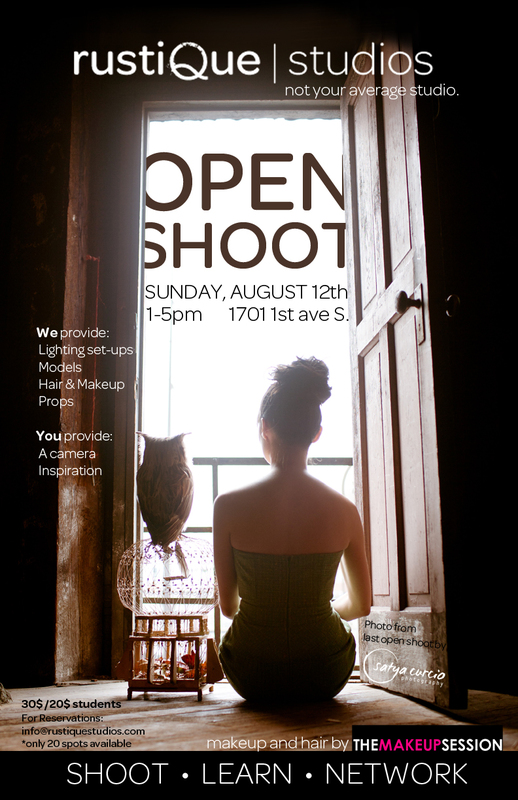 PLEASE RSVP, WE ONLY HAVE 20 spots for photographers! We will be going on a photography excursion starting at the space at 1pm and wandering around the urban haven of the SODO district to play with location lighting! This event is open to all photographers, models, friends, and pets. Join TEAM AWESOME and RustiQue Studios every third Sunday of the month for SHOW YOUR SHORTS film screenings and networking sessions! the community, share thoughts, and discuss the film. -Films should be no longer than 20 minutes. -Everyone who shows a film will receive critique notecards from the audience, as well as a Q&A at the end, a great way to grow as a filmmaker! Suggested $5 donation at the door to support our studio! After-hours following the Pioneer Square art walk, featuring new 2d art on our gallery wall every month, 3d sculpture works, and video art. Interstitial Theatre holds their openings during this event, a curation of contemporary video art. Bring your questions, cameras, and curiousity as Phil, Paul and Julia share their process of photo-making from start to finish. We will learn how your cameras work, why they work that way, and how to manipulate their lighting input to create the image of your dreams. Phil, Paul, and Julia all specialize in different types of photography and processing, so with their powers combined…anything is possible. Learn how to maneuver one of the world’s most powerful editing tools. Julia will not only cover how to find your way around the program, but also tips and tricks on how to edit.